I am sure all of you have heard the old Greek myth about this wondrous and prosperous country of Atlantis which challenged the gods and was punished to forever disappear beneath the waves. 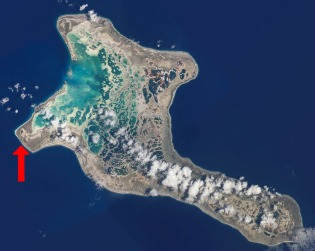 Well, as the human civilization challenges the gods of climate change and our planet changes as a result – the tiny idyllic island nation of Kiribati – will be the first to disappear beneath the waves – and all its 100,000 inhabitants will become global climate refugees. First some geography – Kiribati is the first country where the date changes and the sun rises (not Japan) since it straddles the international date line in the central Pacific Ocean. It achieved independence from the British in 1979 and is a member of the UN and the Commonwealth. With a GDP of only US $ 600 M the island nation is not too wealthy but if natural beauty were wealth it would be. The tragedy is that the highest point of the country is only 2 metres above sea level – as the sea level rises the country is likely to disappear beneath the waves in the next decade or so. They already are at grave risk – as the sea invades their land, it’s sources of fresh water are being lost one by one. Each year the tropical storms get more severe (as we have been seeing all around the world this year) and cause more damage. The President of Kiribati – Anote Tong has petitioned the UN that the industrial countries are responsible for the destruction of his country and they need to provide land for Kiribati people to live after the flood. The petition has achieved little response. 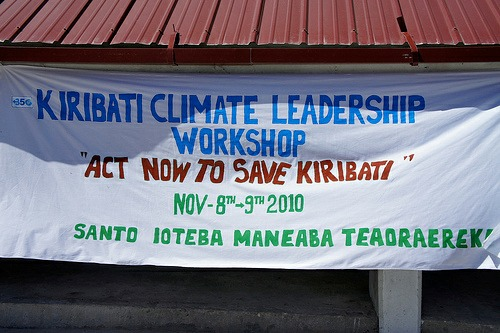 Now the Kiribati government bought 6000 acres of land in nearby Fiji (mountain land I guess) to resettle its people. The Fijians of course don’t like it. One possibility for Kiribati is to leverage its greatest natural resource – the teeming fish in its 1.3 million square km of ocean. The fish are their primary source of income – like oil for Saudi Arabia – and possibly could provide them salvation in the search for a new home. Sadly for the children of Kiribati, the old legend of Atlantis is going to become a reality – the first country to be destroyed by climate change. But be aware: It will not be the last.